While it’s been approved by planning minister Justin Madden, some local residents remain vocal in their opposition. I heard one ring into 3AW last week, trying to make out that the 4-storey development was a “high-rise”, thus trying to paint it in the same light as the old 1960s-70s housing commission megablocks you see in South Melbourne and Prahran and Fitzroy (all very desirable suburbs these days; at the time they they were built they must have been run-down and cheap). I’d have a problem with it too if it were a real high-rise. Building huge tower blocks and filling them with disadvantaged people is probably not going to give you good outcomes. But providing them with housing and spreading them through the suburbs in small-to-medium-sized developments (especially in a spot like this that already has buildings that high) I think can work well. 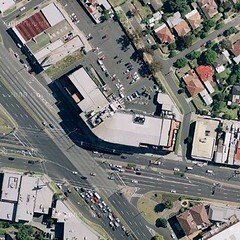 This is particularly the case in a spot like central Moorabbin which is adjacent to the station and closeby to shops and other services, so many will have the choice not to blow large portions of their meagre incomes on being car-dependent. Like other forms of welfare, subsidised public housing gives people a hand-up to help them get their lives together. In my case, my family were not well-off when we were growing up. During my early-teens, we moved a few times due to rising rents, but eventually settled in public housing not too far from the “Bentleigh” development. Together with Austudy funding (now called Youth Allowance) and the Higher Education Contributions Scheme (effectively a loan of university fees, paid back when I started earning a reasonable amount of money), this hand-up from the government allowed both my sister and I to work part-time as we studied, and to enter the workforce with university qualifications. The result is that our working lives, we’ll be paying lots and lots of tax. Of course I know this is not always how it works, but I reckon the government (and the country) made a nice tidy profit on us. Helping when it mattered has helped my sister and I reach our potential. And that’s why it makes sense to give people a helping hand. I am amazed that the Moorabbin ‘highrise’ is still problematic. It started years ago. Hats off to Moorabbin people who fought an unworthy fight. There are things in Moorabbin worth fighting for though. And here I was thinking you went to MH because you were very clever, and so auto got a subsidised place at Uni. I thought the problem there was the fact that the development was being built over the carpark used by the local businesses, not that it was highrise.